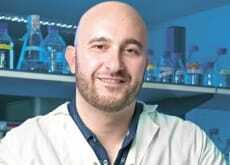 NYSCF – Robertson Stem Cell Investigator Dr. Jacob Hanna, of the Weitzmann Institute of Science, co-authored a paper published in Cell describing the creation of cellular precursors to human egg and sperm cells using human induced pluripotent stem cells. This is the first time that human cells have been programmed into this early developmental stage. This work could help provide answers to fertility problems, provide insight into the earliest stages of human embryonic development and, potentially, lead to new reproductive technologies in the future.